What is a Light Weight Trailer ? What is a Ultra Lite Trailer ? What is a Hybrid Travel Trailer ? The philosophy of Micro-Lite is that you shouldn’t have to own a large vehicle to have fun. Owner Chuck Ornduff started with customizing vans in 1995. He fell into the trailer industry by accident when he built a cargo trailer to haul parts for a project car he was working on, and people wanted to know where they could get one. In 2006 Chuck created Micro-Lite Manufacturing, targeting people with motorcycles, 4-cylinder cars, and small trucks. There are three different designs for motorcyclists and their largest design, the Vymeron, weighs just 1,250 pounds. 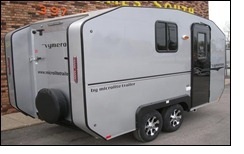 Everything on Micro-Lite trailers is aluminum and they take advantage of every space. The company can build most of their trailers in about a day and a half, though the larger models take a little more time. Micro Lite Trailer Mfg. sells about 250 to 300 models a year. They like the fact that they are small and can do custom work. They offer LED lighting and you can even have an air conditioner if you so choose. The Vymeron is the larger model and you can stand up inside, just as you can with the Car-Go Lite Xtreme. Most of their models are for the consumer who likes practicality and light weight. These products are unique and if you own one the curious will likely come to talk to you about this “trailer” you have. They are reasonably priced. To find out how Micro-Lite compares to other travel trailer manufacturers in areas of quality of construction, customer service and more order our Travel Trailer Buyer’s guide today. 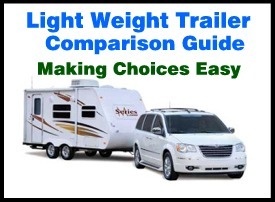 Become an informed buyer and you’ll have helpful tips to negotiate the maze of buying a light weigh travel trailer.